Ok, let me now describe my personal Wii experience. The first word that came to my mind after using Wii was: intuitive! The new motion-sensitive controllers are in my opinion amazing and playing the games feels so natural. You just use the controller as if it was a tennis racket or a baseball bat and that’s it. Before I got the Wii, I was a bit afraid that playing Wii Sports would soon get boring, but it just doesn’t. It feels like a real game and it is a totally engaging and addictive game (also, the muscle ache the day after was 100% real - I was never really ware of all the upper-body muscles you can train with playing those sports before I tried Wii Sports :-/). 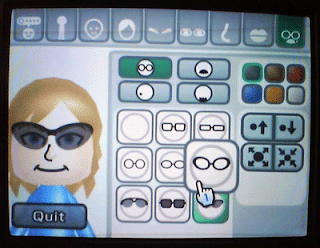 The Miis are sure a cute feature, but as an Internet addict I must say that I enjoy the web browser much more. The Wii browser is still a Trial version and I think there is still a lot of room for improvement (like encoding settings - right now the browser can’t display certain specific characters of my language), but at a first glance it looks ok. You can zoom in or out on web pages, which is really useful because of the low resolution of TV screens. The browser has Flash support, and there are already web sites with flash games that can be easily played on the Wii (Google Wii flash games). You can also watch YouTube or Google Videos with no problems. Browsing with the Wii Mote is over all very intuitive and easy to learn. When you need to type a web address or fill out a form you use an on-screen keyboard - you can’t type as fast as on a real keyboard, but you get some help in the form of word suggestions and I really like the fact that it provides a subtle tactile feedback (the remote vibrates slightly when you move over a letter). Now a few weak points I noticed so far. Firstly, a quite annoying problem with the keyboard interface: it isn’t good for editing fields with existing text - let’s say a wiki page or blog post - because it doesn’t show the content of the field, but just lets you type in new words. I hope that gets solved in future versions. And on the subject of the Wii Opera browser: I came across the post Using the Wii Opera browser for educational purposes today and I was really surprised to see that kids find playing flash games with the Wii Mote so engaging. Surely, flash games are only mini educational games (for more on the subject read Marc Prensky’s article In Educational Games, Complexity Matters), but I really think that the physical involvement that the Wii provides is an engaging form of not just playing games but also learning. Here I must point out that the Wii is a new player in the gaming industry and still has room for improvement and even more room for new games. I think that in a few years we could be seeing really interesting games that will know how to fully use the potential of Wii’s specific controllers and that will also provide great, engaging, and meaningful learning experiences. Moving on - why is there now RSS reader on the Wii? It has a great news channel, a browser, so why didn’t they include an RSS reader? I sure hope they’ll be adding it soon - either as part of the browser or as a separate channel. And at last - the interface design is quite simple, but I think it could be made even more simple (bear in mind that I am a Mac user and have quite high standards as far as the UI simplicity is concerned ;-) ). A more annoying thing is that switching between Wii applications is a bit slow. I know it’s a console, but from my perspective you have to wait a bit too much just to switch from the weather channel to the news channel for example. Waiting for a dozen of seconds is not such a problem when you’re waiting for a game that you’ll be playing for hours, but when you have to wait just to see the weather or check the mail… it is annoying. So I hope they’ll improve that somehow in the future as well.